Last weekend I played with fire from ice. It seemed like a perfect weekend - lots of sun and not too cold. The bad news is that I did not get a coal. The good news is that I think I learned a lot. On clear ice: One can chop out a chunk of ice from a lake - but this can be a lot of work to get a large enough "blank" for making a lens. We had a hole in the ice on a lake to get water. Overnight the hole froze over - with what seemed to be a perfect "blank" for a lens. While the existing lake ice was a mess - i.e. there were good layers, bad layers, slush, snow etc - the new ice was close to perfect. 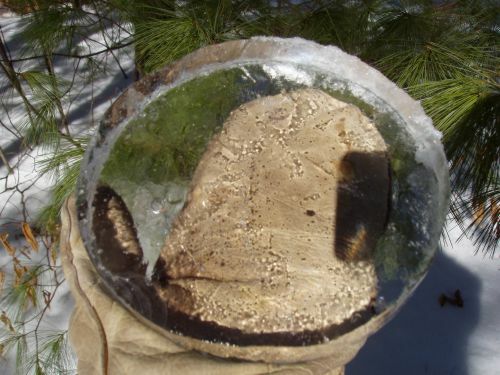 Here is a picture of the "blank" that I made from the ice from the hole. I spent many hours shaping the "blank" into a lens. I thought I did a pretty good job. This second picture shows one stage of the lens. I thought that I would have things nailed. It was a large lens, so I figured I would be collecting lots of sunlight. As it turns out, with the ice "blank" only being about an inch thick, a lens of the diameter that I had ended up having a focal length way to long. The result was not enough sunlight was concentrated to light any tinder. I could feel warmth on my hand, but it wasn't "burning" hot. Lesson learned here is that the profile of an ice lens needs to be very aggressive. With ice an inch or so thick, the diameter of the lens is going to be 3 or 4 inches. This is still a guess - since I did not succeed. There is of course a trade-off between the amount of light collected, and the amount that the light is focused. Still more work to be done here. I think a working ice lens is going to be very thick. The third picture shows my second try. 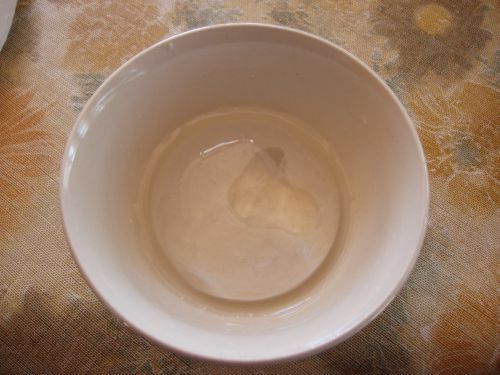 I took a piece of the clear ice and slowly melted it into the bottom of a bowl. The bowl was sort of spherical in shape, so after slow melting, I had something which looked like a pretty good lens. It didn't work either! I still needed more focus. 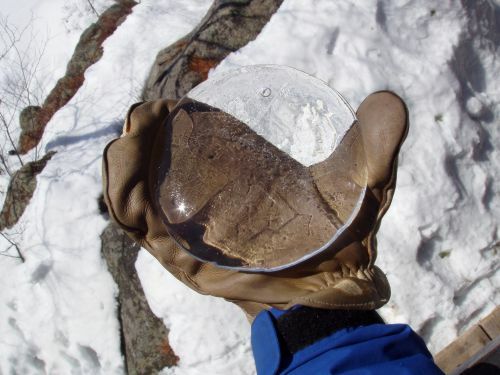 Also, as the ice warms, it tends to get small cracks in it - which of course doesn't help any! No success, but there are lessons to be learned in failure. Another thing that I want to try is an ice sphere. Something like the saran wrap lens (see Fire From Water) - only with frozen water. Certainly this would have the most aggressive possible curvature.